As a landlord, you will be approached by all kinds of tenants. One day you might just receive a disabled prospective tenant. Do you know how to help them? 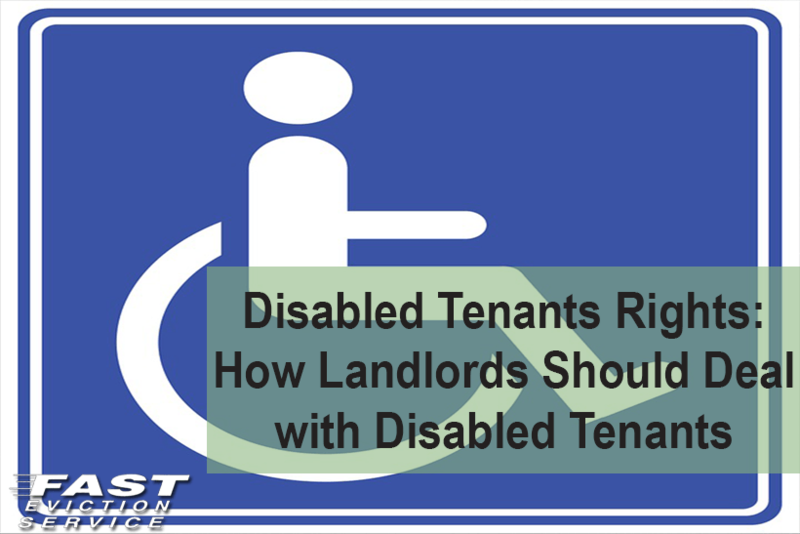 Chances are that you are unsure of the rights that protect disabled tenants. What are disabled tenants rights? For instance, did you know that you cannot ask the tenant to produce their medical records? Indeed, you are not legally able to demand to know whether a prospective tenant is sick or disabled. In a nutshell, the law expects you to treat the disabled tenant the same way you treat the able-bodied tenants. To accommodate someone who is physically or mentally challenged, the landlord must follow what the Fair Housing Act says. The Fair Housing act defines persons with a disability to mean those individuals with mental or physical impairments that substantially limit one or more major life activities. These can include Musculoskeletal problems, such as back conditions and other dysfunctions of the joints and bones. Senses and speech issues, such as vision and hearing loss. Disabled Tenants Rights can also include people suffering from respiratory illnesses, such as asthma and cystic fibrosis. To help the person with special needs face their mobility issues, you should act reasonably. For instance, you may have to let the new tenant modify your house so they can move around with ease in what is known under the law as “Reasonable Accommodation”. Additionally, you must let them modify some outdoor communal areas. In housing units that receive federal assistance, the disabled tenant might not make changes at their own expense. If they need some grab bars or a dog, perhaps, you should let them even if it is against your policies. One thing you should never do is to send the tenant away just because of their physical appearance. Instead, you have to give them a tour of your property and let them view vacant houses. If they like one of your vacant units, there is nothing you can do even if you do not want them around. It goes without saying that the only rental houses you could let them view are those they could access easily with a wheelchair (if they use it) or without if they can walk. Since the law regarding Disabled Tenants rights demands fair and equal treatment for all tenants, you have a right to show the disabled person all your rental fees. All fees must be related to the house they want to rent out rather than their disability. As the wheelchair might cause damage to the floor, you should not charge your customer a larger deposit for rent or security deposit. This is prohibited by the law. Moreover, you should allow the disabled tenant to use a caregiver if they need one. Still, you cannot talk about the renter’s disability to other people in the property. The law does not permit it. As a way of making the renter discouraged with your property, you might tell them that all your vacant units are inaccessible. This is wrong in the eyes of the law. It is only the tenant who can decide whether the units they have seen are accessible enough. Knowing and understanding Disabled Tenants Rights are key for any landlord to successfully avoid expensive lawsuits and keep everyone happy. For more information of Disabled Tenants Rights do a web search of the Fair Housing Act.